When it comes to pipeline construction and usage, safety is critically important. Regardless of the pipeline distance or what substance is being transported, you need to ensure that extreme loads can be transferred efficiently while simultaneously maintaining structural protection of the pipe. At B8 Ventures, we have a solution. Our eco-friendly pipe pillows are designed to safely provide pipeline support and are durable enough to last for the lifetime of the pipe. Manufactured in Canada, the pipe pillows are constructed from 100 percent recycled rubber. The shape is designed to effectively transfer extreme loads are stackable to accommodate various height requirements. 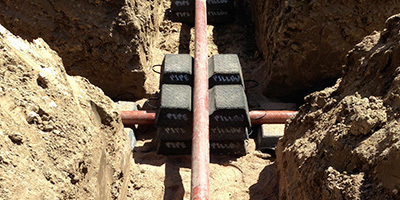 Pipe pillows are heavy enough to resist flotation, and simple to handle and install. While pipe pillows were initially developed for long-lasting support within a trench, they can also be used as a pipe support during the stringing process, a means of supporting exposed pipelines during and following integrity digs, and as a low level pipe support when stockpiling pipes. They are available in 2”- 6” and 8” – 10” profiles. When you partner with B8 Ventures, pipe pillows make your project safer, more secure, and easier than ever. To place your initial order, contact us by phone or online today.